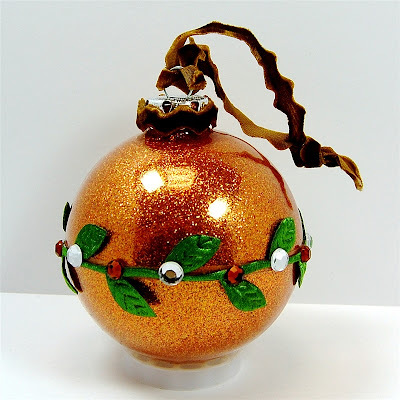 Creative Charms is having an inventory clearance sale. 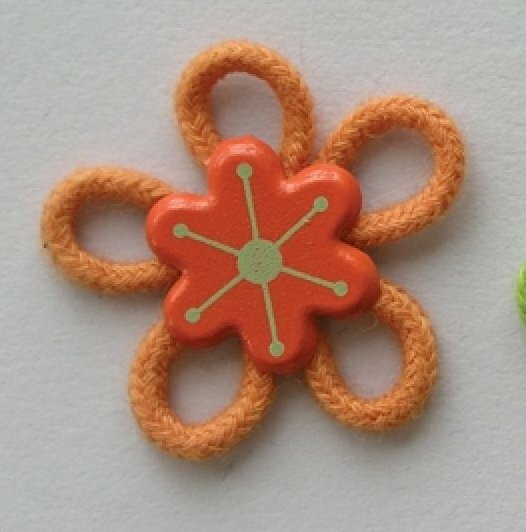 The sale is starting off with the Loop d' Loop items at incredibly low prices.. You need to buy in groups of six packages for the Braided Daisy and Groovy Petal Medleys - the Fuzzy Daisy Kit can be purchased in single units. These prices represent a huge discount and all items are offered while supplies last. This is your last chance to stock up on your favorite Creative Charms items. Here are some of my projects featuring these lines. You can click on the photos to go to the original post for each project. 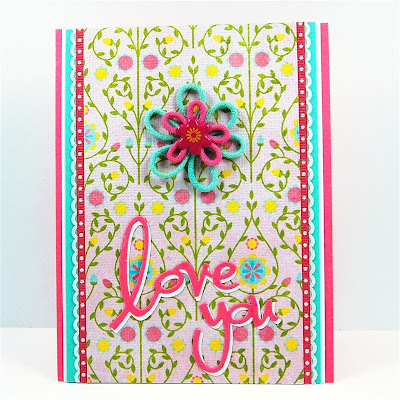 I layered two Groovy Petal flowers on this card. 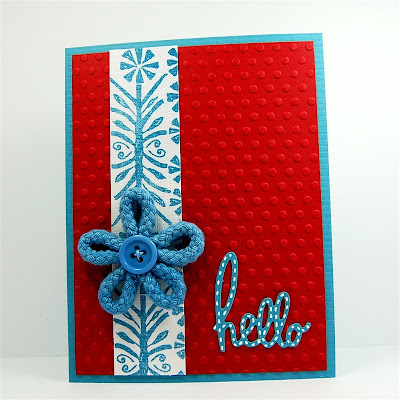 The Fuzzy Daisy Kit includes the leafy ribbon I used on this ornament. 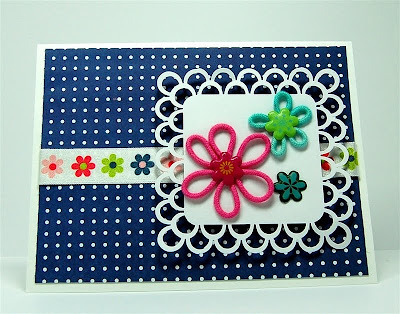 More Groovy Petals (with the centers exchanged to gem brads) on this card. 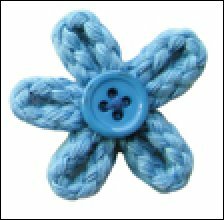 A braided daisy - I love the button centers! 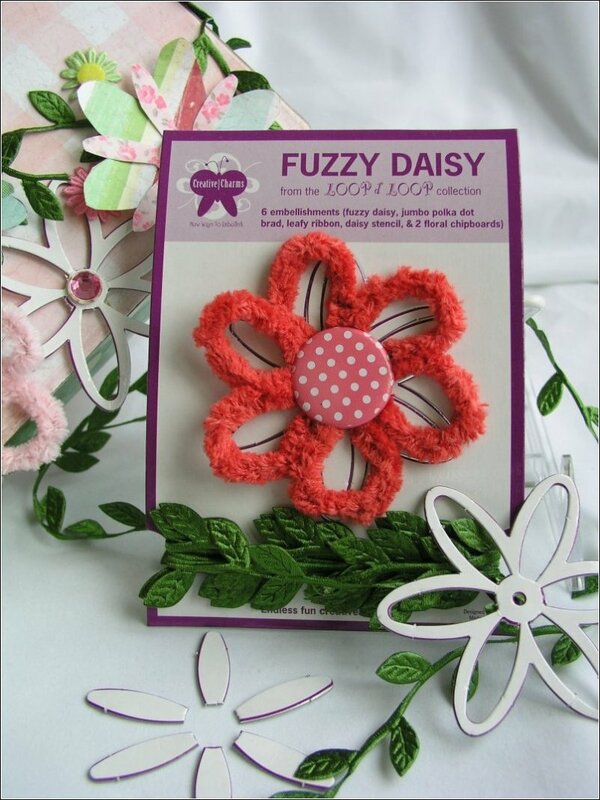 The Fuzzy Daisy has such a nostalgic look - it makes me think of chenille bedspreads and robes. 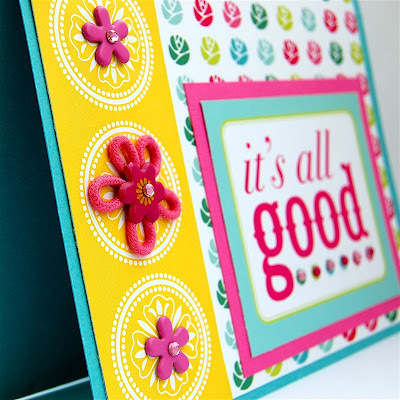 Groovy Petals come in such cute bright colors! 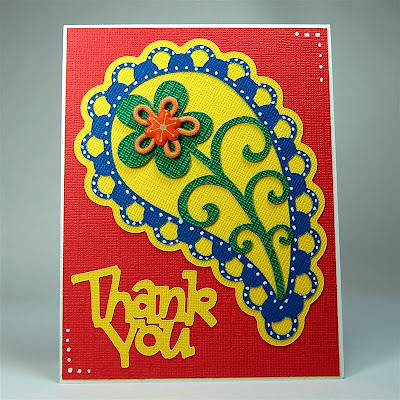 I added a gem sticker to the center of this Groovy Petal flower for added sparkle. 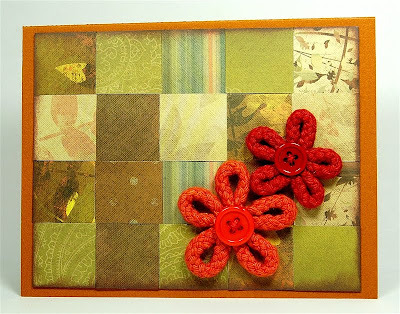 Two sizes and colors of the Braided Daisy Medley on this woven front "quilt" card. 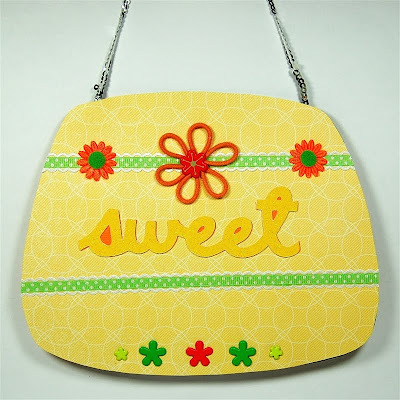 Another Groovy Petal on this door hanger sign. The five petal shapes work nicely with lots of Cricut cuts. The February Cartridges have been added to Design Studio. 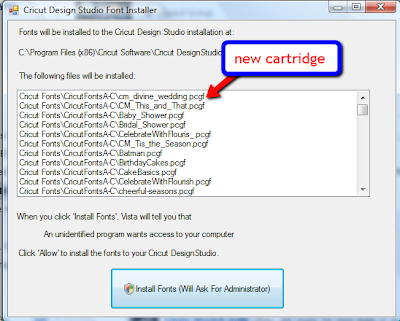 To update your program, click HERE to go to the update page on the Cricut.com site. Scroll down to the Cartridge Content Update section and click the download button. The cartridges to be added are listed above. The Creative Memories Divine Wedding cartridge is full of beautiful wedding images and great fonts and monograms. I have had some emails asking about purchasing this cartridge. It will be available starting on March 1st on my CM Personal Website - it should be on This Page with the other cartridges. This window will pop up and show the update as V120216. Be sure to SAVE the update file and then run it so it will install correctly. If you have Design Studio open when you install the update, you will need to close and reopen the program to see the new cartridges. When you open the downloaded update file, you will see this screen. Just click to install the update. You will have to give permission for the update to install on a separate screen. I'll be busy today getting packed for my trip. Apparently not only 'cute shoes" but also sparkly evening outfits are expected at this event! I fly very early tomorrow morning and will try to have posts scheduled for the days that I am away. I might have a chance to post a few photos while I am gone but they may have to wait until I get back. 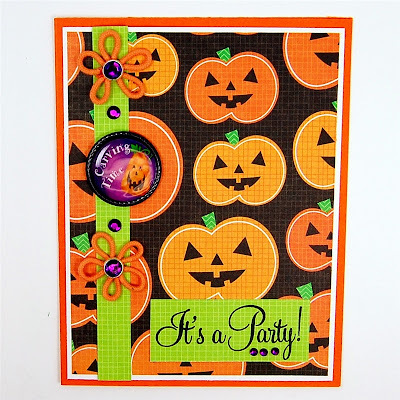 Diane, Thank you very much for the info on the CCR update and the Creative Charms sale,.